Matthew Apgar - mapgar@shawmedia.com A tow truck operator from Whitey's towing works on removing a truck from deep in the trees on Pyott Road on Wednesday morning, March 14, 2018 in Lake in the Hills. 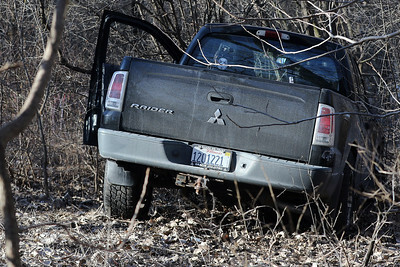 Matthew Apgar - mapgar@shawmedia.com A truck is stuck deep in the trees on Pyott Road on Wednesday morning, March 14, 2018 in Lake in the Hills. 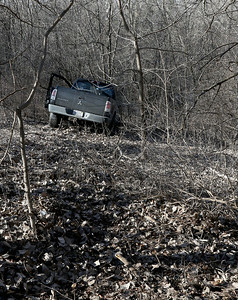 A tow truck operator from Whitey's towing works on removing a truck from deep in the trees on Pyott Road on Wednesday morning, March 14, 2018 in Lake in the Hills.